The controversy over gold mining in Chalkidiki, a province of rare natural beauty in northern Greece, is dominated by the specter of far-reaching, long-term environmental destruction. However, dubious political machinations between Greek Government officials and private companies, scandalous agreements against the interests of the Greek State, and a violent police crackdown on locals who protest against the mines, also hang over this deeply divisive issue. Now, we learn that Eldorado Gold, the main investor, has a cunning plan to solidify its investment: It will use Article 107 of the Greek Constitution, on the protection of foreign capital. And the Greek Government is ready to dance to the company’s music. Yet, the question remains: Will the investment be overall beneficial to Greece? The evidence at hand suggests it will not. A few days ago, after an attack by masked intruders, who destroyed machinery at the gold mining site, the Prime Minister of Greece Antonis Samaras said in a statement to the Wall Street Journal: “This kind of act cannot be tolerated. Greece is a modern European country, and we will at all costs protect foreign investment in the country”. So, it appears that Canadian multinational Eldorado Gold, one of the biggest mining companies in the world, is winning the battle so far, having found a staunch ally in the Greek Government. This is hardly news. Greek Governments have supported the interest of mining companies for decades. The company has made assurances it will make “every effort possible” to protect Chalkidiki’s unique nature. In any case, according to the investment’s supporters in the Government, in the Council of State (the Supreme Administrative Court of Greece), and in most Greek Media, environmental concerns should not be made into such a huge issue: even if the environment suffers to a point, they say, that’s a fair price to pay for such an investment, which will bring much needed development to crisis-laden Greece. But is this the case? Both the evidence at hand and the history of gold mining in Chalkidiki contradict the view of the investment’s supporters. They rather show that Eldorado Gold’s investment won’t be all that beneficial to Greece – at least within the terms the Greek Government appears so eager to offer. It will certainly be beneficial to the company though, which is poised to take advantage of a reserve estimated to be worth 13bn euros. People’s struggle against gold mining in Chalkidiki has been going on for years. Greek Governments, both in the past and at the present time, have responded with increasing police violence. Alongside massive public protests, there have been occurrences of sabotage in mining facilities, to which Governments have responded with further crackdowns by Riot Police, tear gas, plastic bullets, unwarranted detentions, and even forced DNA profiling of local residents. Meanwhile, Greek Governments have continually been granting larger and larger areas for exploitation. The renowned Cassandra Mines, that were sold in 1995 to the Canadian multinational company TVX GOLD, actually include three mines: the Madem Lakkos Mine, the Mavres Petres Mine and the Olympiada Mine. In 2000 the company started mining for gold under the village of Stratoniki. 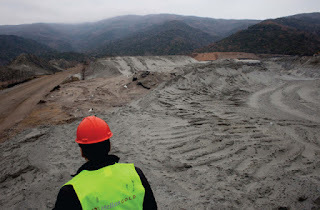 The landslides caused by the blasts became a daily occurrence, and in 2002 the Council of State halted the company’s actions. The company decided that… it was going bankrupt. In 2003, through a procedure so scandalous it has been gaining in notoriety ever since, the Cassandra Mines were transferred to a newly created company, Hellas Gold. In 2006 Hellas Gold filed a study plan for open-pit mining at the forest of Skouries Megalis Panagias. The Ministry of the Environment granted initial approval for the project in 2009, but the residents of the area build outposts and prevented the attempted drilling. In 2011, Minister of Agriculture Giorgos Papakonstantinou approved the environmental study of the company, while one year later the Council of State dismissed the people’s petition against it. It ruled in favor of continuing the exploitation of Chalkidiki’s gold mines, reasoning that “the investment is particularly advantageous for the national economy”. What happened between the Council of State’s first and second ruling? Sources on the ground point at the change of people in charge, after the retirement of Michalis Dekleris, the former vice-president of the Council. They mention the “Decleris Doctrine” that had influenced the judgment of many of his colleagues. “One couldn’t even cut a single tree trunk,” they explain. And then what? Then came the crisis, the troika’s visit to the Council of State, and its call for “development”. Hellas Gold has lately launched a massive advertising campaign across the Greek Media. The company’s broad communication offensive, which occurred rather suddenly since Hellas Gold almost didn’t have a website since it was founded in 2003 (its website showed an “under construction” sign), highlights the breadth and importance of the development that the investment will bring. The campaign’s goal is twofold: to mitigate the charges against the company in relation to the environment, as well as to link the investment with the crisis. Namely, to create the notion that, despite the possible disadvantages, the benefits for Greece’s development will be more important given the country’s woes. As far as the environmental impact is concerned, one should be rather careful. Both the international and the Greek experience contradict the company’s claims. For example, anyone who has even passed by the PPC outdoor lignite mining in Ptolemaida, will find the claims about land and forest restitution rather unconvincing. What about the benefits for Greece, though? This was the basis of the Council of State’s decision, on July 24th 2012, when it rejected the residents’ request for suspension of the mining activities until the Supreme Court’s final adjudication: that we need development in a time of crisis. As the supporters of the company say, for each developmental project, one must calculate not only the potential damage, but also the possibility of profit. One must weigh the costs and benefits. So let’s sum it up. Who’s winning? For one, the shareholders. As it is reported, the value of the company’s shares grew by 9.6% since the then Minister of Environment Giorgos Papakonstantinou approved the environmental study on July 26th, 2011. But let’s go back to 2002, in order to see with which moves –controversial, to say the least– the current protagonists of the story came to the forefront. Back then, the plenary of the Council of State decided to cancel the decisions of the competent ministries (the ministry of Public Works, as well as the ministries of Culture, Agriculture, Development and Economy) that gave the green light to the multinational company TVX HELLAS (a subsidiary of its parent company and financial guarantor TVX GOLD from Canada, which was later acquired by Kinross Gold Corporation) to exploit the Cassandra mines. The court justified its decision by pointing at the violation of environmental protection, the depletion of water resources and the need to safeguard the residents’ health from the explosions. A few months later, in May 2003, TVX HELLAS filed for bankruptcy citing debts of 216.156 million euros to its parent company, to social security, the state, its employees and its suppliers. There are many who recognized that bankruptcy was a sure way of avoiding responsibility. The unpaid workers locked themselves up in the mine galleries, and some went on a hunger strike, while the discussions were starting on the company’s bankruptcy claim. As it is well known, Christos Pachtas was forced to abandon the central political arena due to a scandal of illegally registering woodland at Porto Carras, in Chalkidiki, in 2004. However, in 2010 this did not prevent him from being elected mayor of Aristotelis in Chalkidiki and currently to fervently support gold mining. Back then though, in 2003, Pachtas was still a deputy Minister of National Economy in the Government of Costas Simitis. The State waived its asserted claims against TVX for taxes and social contributions of 2,2 million Euros. TVX GOLD waived its claim for 218 million dollars against TVX HELLAS for unpaid loans. The Court of First Instance in Athens revoked the bankruptcy decision for TVX HELLAS. The Deputy Minister of National Economy, Christos Pachtas, and the Deputy Minister of Development, Alexandros Kalafatis, as representatives of the Greek Government, signed two successive contracts: A judicial settlement of TVX HELLAS’ claim against the Greek Government for lost investment funds and lost profits, as well as a judicial settlement of the state’s claim against TVX HELLAS for violations of environmental regulations, as well as for the ensuing environmental damage. After the settlement, the state bought from TVX Hellas, who had just declared bankruptcy an hour ago, the assets of Cassandra Mines for 11 million euros. With the ensuing contract of the same notary, the Greek Government “transfered” to HELLAS GOLD SA the total assets of Cassandra Mines “for 11 million euros to be paid directly to TVX HELLAS”. All of the above were ratified by the Greek Parliament with the 3220/2004 law. It is striking that the Greek State decided to transfer the gold mines to a company that was founded just three days earlier with a share capital of 60,000 euros. The situation perhaps becomes a little clearer when we consider that it was founded by Dimitris Koutras, president of AKTOR and board member of ELLAKTOR, together with George Sossidis, board member of ELLAKTOR. Both AKTOR and ELAKTOR are construction companies controlled by construction magnates and Media moguls George and Fotis Bobolas. Father and son, they control a large part of Greece’s construction industry, as well as several newspapers and magazines, as well as shares in the most influential national TV station. This is the company that once more operates in Chalkidiki and to which the land in Skouries was ceded. But this happened after several changes. Since 2003 various companies have entered and exited Hellas Gold through the acquisition of shares, like European Goldfields (whose major shareholder is the Romanian oil magnate, Frank Timis, allegedly implicated in scandals of organized crime and drugs). But let’s leave aside these individual stories, and focus on those who currently hold the exploitation rights for 317 thousand acres in northern Greece. Maybe out of anger due to the silence of mainstream Media on the issue, many people are talking about “Bobola’s mines” when they are referring to the attempted mining in Chalkidiki. The well-known businessman, whose people came forward with the acquisition in 2003, today has only 5% of the shares in the investment scheme that will operate in the region. The remaining 95% now belongs to Canadian Eldorado Gold. After a lot of research, we were able to locate someone with a very good knowledge of the negotiations, who has followed the agreements closely. We promised to protect his anonymity, and he started to unravel an admittedly interesting political tangle. “In this particular situation” he says “the Greek Government was nothing more than an intermediary between two private investors. With two notarial agreements in one day, it sold the mines, which it never really owned, for 11 million euros”. Giving us a first notion of the real benefits of the so-called “necessary” development, he added that: “Accordinng to the Mining Code, which is a legacy of the military junta, the Greek Government has no royalties on mining exports. In 2011, Romania doubled its mining royalties from 4% to 8%. Greece is getting 0%”. In 2011 the European Commission fined Greece 15.34 million euros for the transfer of the Cassandra Mines to Hellas Gold, acknowledging that the Greek Government had damaged the country’s interests by this transaction. Giorgos Papakonstantinou, who was then minister of the Environment, appealed the decision. “He was overzealous!” our interlocutor explains with a laugh. “Eldorado Gold would have no problem paying that money. The investment it made was 400 million dollars and the expected profit could reach 13 billion. The 15 million fine would be a ridiculous sum. In general, the company does not like to get involved in such cases. That was the reason that initially it hid behind Mr Bobolas. He contributed his political acquaintances and he will undertake all the infrastructure works. The rest will be handled by Eldorado”. As we learn from our source, Eldorado’s biggest problem is SYRIZA, the Coalition of the Radical Left, Greece’s Main opposition party since the last June national elections. The party is dealt with on two levels. “First of all” our source explains, “since this summer Eldorado has opened offices in Greece. So it is rebutting SYRIZA’s argument that it is not taxed here and therefore the Greek public will not have any gains from gold mining. So far, though, the company hasn’t presented any tax returns”. However, before the development proponents start popping bottles of champagne and cheering in favor of the investment, let’s see the terms with which they are about to be taxed. “The rise of SYRIZA” he says, “and the possibility that its business could be nationalized scared Eldorado. The recent elections removed this possibility, but in order to safeguard its future, the company intends to make use of Article 107 of the Greek Constitution, which is about the protection of foreign capital. This is a 1953 law –a milestone year for Greece’s capitalist development– passed in order to protect the Esso Pappas and PECHINEY companies. Later on, it was used by Hyatt (Casino), Heracles, TVX GOLD, and most recently Hochtief at Eleftherios Venizelos airport. Under this provision, two key benefits are ensured: a fixed tax rate at 10% and the guarantee that for ten years nothing can change in the company’s operational status in Greece. The investment is made irreducible by Presidential Decree”. The Foreign Capital Directorate is run under the Minister of Development Costis Hatzidakis. After the decision of the Ministry –which, according to our source, has already been tacitly ensured– and the issue of a Presidential Decree, the next Parliament cannot change anything by law. One needs to change the Constitution. Could it be possible then, we ask, to appeal the approval given by Giorgos Papakonstantinou, if for example it is revealed that he was involved in the scandal of the Lagarde List? “Papakonstantinou is covered” our source replies. “He presumably acted with the approval of the County Council”. “Which County Council are you talking about? County councils were abolished at the end of December 2010, since we moved to the system of peripheries. The County Council that was consulted was to be abolished in a few days. And it unanimously voted in favor. When we asked the county councilors how they found the time to read 4,000 pages of environmental studies, they said that they had not read them. Nevertheless, they voted in favor of their legality”. As outrageous as all this may sound, everything that the observer of Hellas Gold’s agreements says is uttered in a deadpan tone of voice. He seems to be speaking about decisions already made, in which no one can intervene, as if the case is already closed. “Koutras, who was the frontman in Chalkidiki” he says, “as well as George Markopoulos who is general manager of Thrace Gold Mining (where we can also find Eldorado’s imprint), are working on this issue since 1994. For almost 20 years they have faced everything in order to make the mines work”. And what about the residents’ appeal pending at the Supreme Court? “Until then” he replies, “the infrastructure will be almost finished and mining will have begun. There are legal precedents for situations like that. Even if by then the Council of State is full of communists, the only thing that they can do would be to make the company plant a couple of trees more during rehabilitation”. Adapted from a report by Mariniki Alevizopoulou published in UNFOLLOW magazine (issue 14, February 2013).